When you have had a major disaster, it is often necessary to get a very large amount of data back in one go. This is often too large to get by downloading from the online server using the Internet. Thus if you have a major disaster that has lost a whole computer, you should contact Solid Data using the support contacts at the start of this guide, and request a hard drive be provided with all of your data. If you have a smaller incident, you should follow this process. Select the “Restore” tab on the OBM control panel. Select the backup set you wish to restore, then click NEXT. Select the date of the backup from which you wish to restore files (default is the last backup, ie yesterday) – NB: if you want to restore the latest copy, you can leave this as it has come up as default. Expand the tree in the left hand column until you find the file(s) you wish to restore. Tick the file(s) and/or Folder(s) you wish to restore. 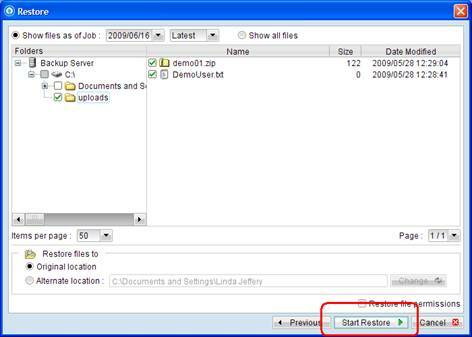 Select the radio button to restore the file(s) to an alternate location then use the Change button to say where to put it (NB NEVER select to restore to the original location in case you overwrite good files). When the restore process is complete, a confirmation email report will be sent. As part of the Plan you have a hard drive in your pharmacy that stores a local copy of all of your backups. This enables you to get access to the files to do a restoration at any time, and generally faster than downloading from the backup server. The reason you would use your local copy is often where you have a corruption, file deletion, or need to go back to an older version of a file, but you haven’t had a major crash that has destroyed all of the computers. Select the “Decrypt Local Copy” button on the OBM control panel. a. Go to the URL: https://backup.solidit.net.au/obs/user/logon.do" . 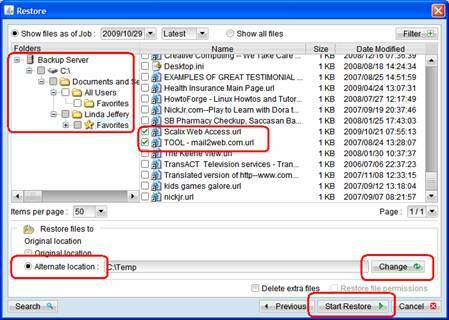 e. Use the folder list with the Plus-Sign buttons to navigate the folders, then tick the box of any file you wish to restore.